This paper is dedicated to our co-author and friend, late Prof. István Markó (1956-2017), for his lifelong commitment to the energy and climate problem. The hidden consequences of a massive use of intermittent renewable energy systems for electricity production are highlighted, using existing electricity production data from Germany from the last 5 years, where presently a system is in operation with an installed capacity of about 50 GW in wind turbines (sum of onshore and offshore wind) and 40GW in photovoltaic panels. This fleet of intermittent renewable systems produces more than half of the yearly renewable electrical energy of Germany, the rest being produced by hydro, so-called ‘biomass’ and a very small fraction of geothermal sources. The high variability of both sun and wind leads to periods of massive overproduction as well as renewable power shortages. To compensate this, ideally, both storage and backup power should be able to deliver at any moment nearly the full load of the grid. However, storage at the scale required for a hypothesized 100% renewable system is not feasible with current technologies. Battery storage is totally insufficient and will need a substantial technological breakthrough. Power-to-gas(methane)-to-power has a low overall efficiency (~15%) due to the various transformations involved and thus wastes essentially most of the carbon-free excess power. Hydropower systems require huge volumes of water with a height difference of a few 100 meters, and options for such storage locations are nearly exhausted throughout Europe. Trying to reduce storage using cogeneration of power and heat plants has the drawback that such systems often produce heat when only power is needed or power when only heat is needed. It is clear that there is an urgent need for a critical assessment of the practical feasibility of a 100% renewable power system with due consideration of the required backup/storage system. If the outcome of these studies is that the required huge storage systems are unfeasible and that at the same time fossil and nuclear options are rejected, the only solution is to adapt the activity of the society to the availability of electricity and to restrict power availability to part of the population/activities during periods of darkness or absence of wind. If badly planned, we risk entering a new era where daily life could depend again on the variability of the weather, as it was centuries ago. Fig. 1: Electrical power consumption and production in Germany (in MW) by various sources for January 2017: grid load (brown), sum of onshore and offshore wind (blue), solar PV (yellow), installed iRES capacity (light green background color). 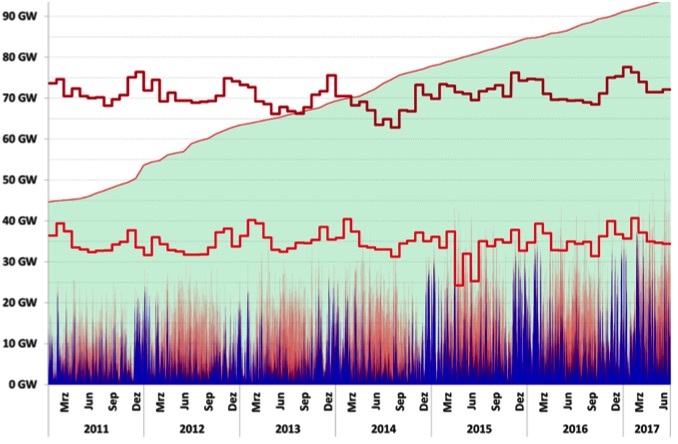 Although the iRES capacity is exceeding the grid load, it could only provide a fraction of the German electrical power needs during this dark period without sufficient wind and most of the power was produced by conventional power sources (fossil and nuclear). Especially the period 16 -25 January 2017 demonstrates the need for large additional backup power systems (that are evidently non-renewable) or storage. If the aim is to decarbonize the electricity sector and phase out nuclear power, then renewable energy remains as the only source of electricity. As wind and solar photovoltaics (PV) are a major fraction (in Germany about 65% of the total renewable electricity production) one then must cope with strong intermittency. The consequences show up most prominently during dark and cloudy periods without wind. The reality of this last statement is illustrated in Fig. 1, showing the evolution of the electricity production in Germany for January 2017. 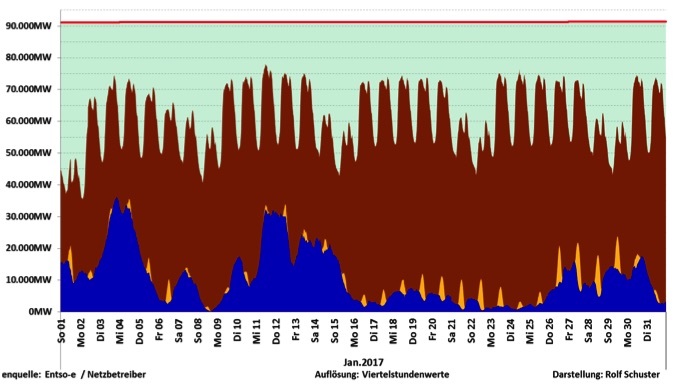 Due to lack of wind and sunshine in the second half of January most of the German electricity during that whole period was produced by conventional power sources - lignite, coal, gas and nuclear power. On the morning of the 24th of January 2017 a nearly total collapse of the German electricity supply took place. It could have had consequences throughout Europe and was only avoided by putting into operation all possible fossil power plants in Germany, including the oldest and dirtiest ones. Fig. 2: Electrical power production (in GW) by wind (blue) and the sum of solar PV and wind (red) compared with maximum and miminum grid load. As the installed renewable capacity increases, the minimum grid load is increasingly exceeded, leading to overcapacity and export of surplus energy, often at negative prices. This graph also leaves no doubt about the storage problem. During the 10 days between 16 and 25 January, equivalent to 240h, the difference between the iRES produced electrical power and the electrical power needs of Germany varied between 50 and 60GW, i.e. between 12000 and 14400 GWh of electrical energy was missing. German electrical storage systems could not have supplied this large amount of energy, as the total storage capacity in Germany is about 40GWh (mainly hydro). The missing electrical energy represents thus 300-360 times the German electrical storage capacity. Including also the 12 dark and wind still days in December 2016, the missing energy would increase to about 32TWh, i.e. about 800 times the currently existing storage capacity in Germany. 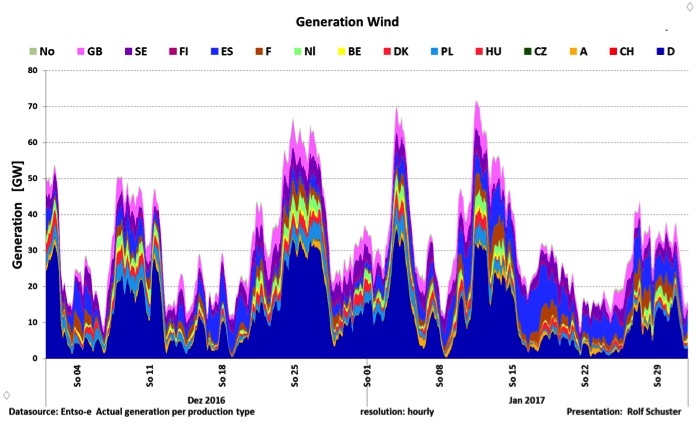 Note that such long low iRES power production intervals are not an exception; similarly, long periods of low combined solar PV and wind power production were observed regularly in the past years, not only in Germany but in several EU countries and predominantly simultaneously, see also below. 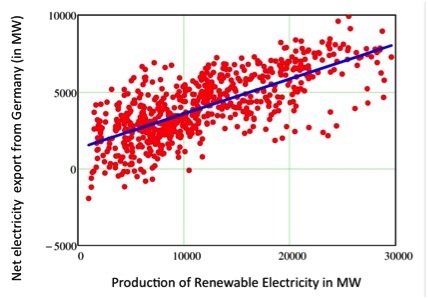 The electricity production from renewable systems is characterized by a low capacity factor. In Germany with its large fleet of wind and solar PV systems, this is ~15%, resulting from ~11% for solar PV and ~18% for wind (sum of offshore and onshore wind). The consequences are shown in Fig. 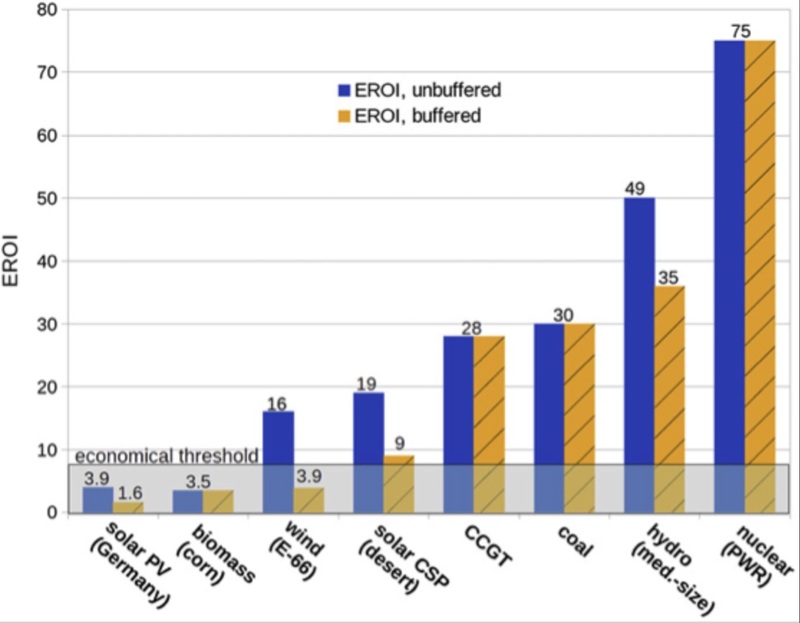 2, documenting the evolution in Germany of the installed capacity and power production from solar PV and wind; also indicated are the minimum and maximum power load of the grid. It is clear (i) that although the iRES installed capacity is huge (exceeding at the moment already the maximum power load on the German grid), its contribution to the German electrical energy needs is limited and (ii) that the peaks of the iRES production increasingly cross the lines of minimum load, thus leading to more and more excess production. For the moment export to neighboring countries is still a solution. But this will have to change when the iRES production in other EU countries also will increase in the near future. 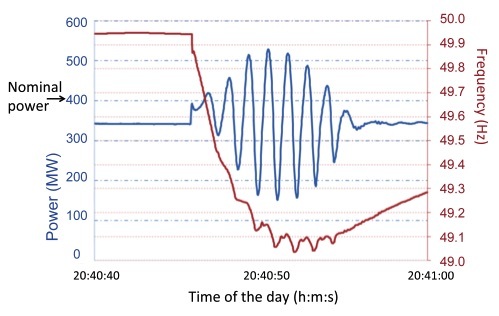 Fig 3: Strong oscillations in frequency (red) and power (blue) at a 400MW generator in Ireland due to high penetration of wind power in powerful short burst during a 20 second interval (24 April 2014, time interval shown from 21:40:40 to 21:41:00). The number of hours with excess production evidently increases with the increase of installed iRES power, leading to negative prices and thus to additional costs for the German taxpayer. The amount of hours at negative prices for the produced electrical energy is steadily increasing since 2010 and so does the extra cost. For example, 97 hours of over- production (or equivalently ~5 days) in 2016, resulted in an excess of 3.83 TWh (less than 1% of the yearly electrical energy production in Germany), with an extra cost of about 70 million Euro. Not only unnecessary export costs have to be paid, but also so-called redispatch costs. Because of the large volume of intermittent wind power produced dominantly in the north of Germany and a power deficit in the South due to the closure of nuclear power stations and/or regular maintenance closures of other power stations including the difficulties to increase the north-south transmission capacity (see also Section 5), regular power ‘bottlenecks’ are occurring in the German electricity grid. To remedy these bottlenecks the redispatch actions are necessary. There are two types of redispatch action: the ones needed to reduce local grid overload (current redispatch) and the ones needed to reduce local over- or undervoltages (voltage redispatch). In the first case, the power output of the plants has to be reduced or decreased, in the second case this has to be corrected by adapting the reactive power in the grid. The costs for these mandatory actions is steadily increasing (with some yearly fluctuations), but is now reaching 1 billion Euro, again to be paid by the German taxpayer. To avoid this, iRES power plants are becoming increasingly decoupled from the grid on very sunny or stormy days. Until recently, this did not lead to reduced income for iRES producers in Germany as they were paid even if they did not deliver power, as stipulated by law (Strommarkt 1.0). Reforms in the legislature (resulting in the so-called Strommarkt 2.0) should reduce such unnecessary payments to producers). Note that the legislature for the Energiewende has been amended 6 times since its introduction (in 2004, 2009, 2010, 2012, 2014 and 2016), i.e. more or less about every 2 years. For a company producing electricity this is far from an ideal market environment. Another important difficulty caused by intermittency is the increased vulnerability of the electricity grid to instabilities. This is particularly visible in countries that are not so well interconnected like Ireland. An example of a threatening oscillation occurring at a 400MW power generator (24/4/2014 between 21:40:40 and 21:41:00) is shown in Fig. 3 (adapted from M.Zarifakis et al., “Models for the transient stability of conventional power generations stations connected to low inertia systems”, Eur. Phys. J. Plus 132, No.6, 289 (2017), op. cit.). Fig. 5: Instantaneous wind power production in MW in Germany (dark blue) compared to the wind power production from 15 EU countries (various colors), illustrating the close correlation between wind power Europe wide. This graph clearly shows consequences for export of excess intermittent electrical power between EU countries in the future, and the very limited extent of possible ‘averaging’ of excesses throughout Europe. production most of the iRES power serves only to increase the export (in several cases at negative prices) as illustrated in Figs. 4a and b and discussed in detail in D.Ahlborn, H.Jacobi, World of Mining, Surface and Underground 68, 2-6 (2016), op. cit. Thus it comes as no surprise that there is a clear correlation between iRES power production (low or high) and export of electricity from Germany, as illustrated in Fig. 4b. This power is not totally lost, as it can help other countries to reduce their CO2 output. However, the German taxpayer pays for this, and such a solution can only be temporary. Contrary to what one would expect, these massive and rather unpredictable imports are not really welcomed in the concerned neighboring countries as (i) local power plants have to reduce or shut down, reducing their profitability, and (ii) it increasingly causes overloads in the national grids of those countries. For such reasons Poland and the Czech Republic are installing phase shift transformers at their borders (paid by Germany) to reflect any dangerously high excess electrical energy imports back to Germany. Fig. 6: Evolution of the CO2 equivalent emissions in Germany (period 1990-2016) together with target values in future years. Yellow bars represent CO2 emissions. Except for some fluctuations, there is hardly any change in CO2 emissions over the last 10 years. With the current rate of reduction in CO2 emissions, one wonders how the targets for future years can be reached. These exports can only be a temporary solution because the same weather patterns often cover large surfaces of Europe. The consequence thereof is illustrated in Fig. 5, showing a comparison between the instantaneous wind power production from Germany and the sum of the wind production in 15 other EU countries: except for Spain, the correlation in the electricity production between the different countries is clearly visible. Excess wind power in Germany signifies thus also excess wind power in neighbouring countries. The difference in the timing of the maxima and minima in wind production in Spain compared to the rest of Europe, can help to average the fluctuations to a certain, albeit limited extent. One could wonder if the averaging effect of solar photovoltaic power could contribute. In fact, such an effect is nearly absent, as shown by a recent study. The same study shows that if one would use a EU wide 100% iRES electrical network, able to transport excess electrical energy production between the various European countries, typical German grid fluctuations could be reduced by 35% and the maximal storage capacity by 28% (with a 30% fluctuation level on those numbers due the varying weather conditions from year to year). Interconnector lines with a capacity of tens to hundreds of GW will then be needed throughout Europe. The export (and storage) problem can thus indeed be somewhat reduced but they will be far from totally eliminated. Other solutions to avoid the enormous excess energy will have to be found. Given the facts above, it is not astonishing that the reduction of CO2 obtained using renewable investments in Germany is rather low. This is illustrated by the evolution of the greenhouse gas emissions over the last 25 years (Fig. 6). The demise of the old and polluting DDR industry (period 1991-2000) led to a reduction of about 20%. The introduction of the Energiewende in 2000 has not led to much decrease in CO2 so far, despite the enormous investments in capacity over the past 10 years (see Fig. 2 and Fig. 7 below), and associated costs. These costs vary depending on the source and what is taken into account, but remain in any case staggering: up to now between 250-300 billion Euro, and estimated between 600 and 1000 billion Euros up to 2023. 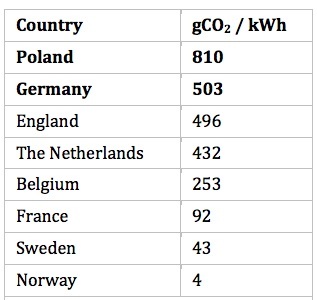 Table 1: CO2 production per kWh for different EU countries. Despite all investments, Germany is still one of the countries that produces the largest amount of CO2 for electricity production. Poland, relying nearly exclusively on coal for its electricity production is the largest producer of CO2 in Europe. The most impressive and direct illustration of the CO2 emissions from electricity production in the EU is provided by the website www.electricitymap.org. This website shows in a very didactic way how ‘clean’ the electricity is produced for the various EU countries. At one glance it becomes clear that Germany is most of the time among the largest CO2 producers per kWh produced in Europe. Poland, that is relying nearly exclusively on fossil fuels (coal) for its electricity, is the country with the highest value. Only in case of windy and simultaneously sunny days the amount of gCO2/kWh reduces to a level comparable to that of Belgium. Countries with a substantial contribution from hydro and/or nuclear power like France, Sweden and Norway score the best under all circumstances. Since the introduction of the EEG (“Erneuerbaren Energie Gesetz” or “Renewable Energy Law”) in Germany in 2000, the investments in renewable installations have increased by a factor of at least 3, with an integrated total cost up to now between 250 and 300 billion Euro. To this has to be added the operational cost, maintenance costs, the profits of the producers etc, estimated for the next years to integrate to something like 400 billion Euro. The reduction in CO2 emissions is in the range of a few percent. Those large investments have an immediate consequence on the household electricity price in Germany, which is now, together with Denmark, the highest in Europe, due to all kinds of taxes added to the electricity price to pay for all the investments and additional costs. Currently (2017) the added cost (the so-called “EEG Umlage” or “EEG levy”) is 6.88€ct/kWh, a factor of more than 3 higher than in 2010. The effect of increasing costs on the household prices is illustrated in Fig. 7, showing that the German household electricity price is about 3 times more expensive than in the USA. A similar trend is visible for the electricity price for industry, although it is kept on purpose lower than the household price (the difference being paid by the households), to keep the German industry competitive. Nevertheless, future plans include a strong reduction of the subsidized costs to the industry. This is a threat to electricity intensive industries in Germany. Fig. 7: Household electricity price (in €ct/kWh for 2014) versus the installed iRES capacity per inhabitant, for various countries in the world. 4. CO2 reductions in Europe in the global context. Only about 10% of the world CO2 emissions are produced in Europe. The first obvious conclusion is that Europe alone only has a minimal impact on world CO2 emissions and cannot “save the world”. But let us again take the example of Germany. The fraction of the total German primary energy produced by renewable sources in 2016 was about 13%, the rest being nuclear (7%) and fossil (80%). Germany’s contribution to the world CO2 production is about 2.4%, including all sectors of society, not just the electricity sector. Estimated CO2 emission savings in Germany for the year 2014 from electricity production by wind and solar are about 70 million tons. This is about 7 pro mille of the current total yearly Chinese CO2 output estimated to about 10000 million tons. Thus, Germany saved a mere 2.5 days of the Chinese emissions in 2014 and this for an integrated total cost of the iRES system up to 2014 of about 300 billion Euro. Several questions come immediately to mind, e.g. how many countries can afford such an investment and is such a cost justified given the marginal results? The discussion so far did not yet include the cost for a huge “Stromautobahn”, (i.e. “Electricity Highway”) another component of the German iRES system, intended to better distribute the energy over the country that could help to reduce the need for storage. A total of about 6100km extra lines will be needed. Massive protests (in the style of anti-nuclear protests) against the construction of these huge lines have led Germany to consider underground lines at an 8 fold higher cost. This will have to be factored into the total cost. Estimates range from 10 to 50 billion Euros, depending on the exact solution that will be implemented. A large fraction of the produced iRES power in Germany is exported. The export was nearly stable and negligible in the years before the massive introduction of renewable power and has increased ever since, with a rapid increase in the last 5 years up to about 25% of the produced renewable energy or about 55TWh (Fig. 8). 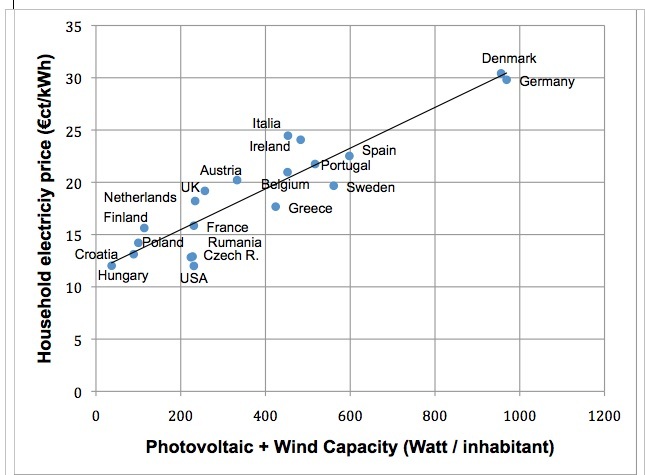 The exported energy matches the yearly produced photovoltaic energy or 2/3 of the produced wind power… However, export of excess energy can only be temporary if renewable energy is to be deployed in all EU countries, given the strong correlation between the weather in neighboring countries as already discussed in Section 2. It is usually believed that this problem could be alleviated using storage. Part of this excess energy is produced in bursts of a few hours, around noon in the case of solar PV, or in gusty windy days for wind power. On very sunny days with sunshine all over Germany, the amount of power in such bursts is currently of the order of 40GW times a few hours i.e. several hundreds of GWh; it will be several times more for a 100% renewable electricity system. Will it be possible to build systems that can cope with hundreds of GWh’s of excess energy in a few hours? A recent study indicates that a 100% iRES system for Germany would require a very powerful back-up capacity, namely able to deliver 89% of the peak load. If this is to be delivered by a storage system, this system must be huge. But this can only become available – if at all possible - after a successful and massive research and investment program. Major scientific and technological breakthroughs will be needed before this problem can be satisfactorily solved. A detailed overview of existing technologies and their prospects is given in Section 6. The study further concludes that because of the variability characteristics of iRES (as measured for Germany), day or seasonal storage systems will be inefficient and other measures, like curtailing electricity generation or demand-side management are uneconomic and/or ineffective. Fig. 8. Evolution of the total iRES electrical energy production and net electrical energy export (in TWh) over the last 26 years in Germany. The total photovoltaic production (dotted orange curve) or 66% of the total wind energy production (dashed blue curve) follows remarkably close the export curve. Another idea is to use the excess energy for heat supply and mobility. The same study concludes that this will again require huge capacities. In conclusion, there are no solutions other than such immense efforts, with uncertain and/or unsatisfactory outcomes, if nuclear energy and fossil energy are a priori excluded and if decarbonization remains the objective. Finally, a 100% renewable energy production/storage system might just be technically unfeasible because of the necessity to keep a certain amount of dispatchable (mostly conventional) power online to guarantee the stability of the grid (for Germany this is about 20GW). Alternatively, one should switch to a Direct Current based grid, at an enormous cost, and this solution is also not free from problems. So far we have discussed the main effects of intermittent electricity production by renewables (see also J. Etherington, “The Wind Farm Scam”, Independent Minds, 2010, op. cit.). The erratic energy generation of renewable energy systems is often considered a minor problem as “one just has to store it when it is produced in excess”. Whilst this is a correct statement, it contains one word too many: “just”! Indeed, storing electricity is far from being easy and, at the present time, there exists very few efficient storage systems that enable us to store energy in large quantities and at a reasonable price, let alone releasing it in the amount needed, at the required rate, power, current and time scale. It is important to underline that electricity is evanescent and must thus be used when produced. It cannot be stored as such but has to be transformed into another form of energy such as mechanical (dams, pumped hydroelectric storage, fly wheels, compressed air), electrochemical/chemical (batteries, hydrogen from electrolysis of water, methanol from reduction of CO2), electromagnetic (supra-conductors, super-capacitors) or thermal (heat). In all cases, some losses occur during storage and release, the exact amount of which depends upon the selected storage technology. The form of mechanical storage required depends upon the nature of the energy released. Hence, if large volumes of energy are to be produced over a long period of time (large power capacity and discharge duration), then dams are the solution. If high power is needed during a short timeframe, then flywheels are one effective solution. To cope with long periods of absence of rain, sunshine or wind, the storage capacity will have to be large, and estimates for Germany go in the range of 100-120 TWh. If this would not be possible, backup power will be unavoidable. The availability of biomass to deliver this backup power is limited and destruction of delicate ecosystems, is already ongoing now. The use of biomass to reduce CO2 emissions is being questioned nowadays, because of the many adverse effects and the inability to lower the cost. Backup power could be partially covered using hydro systems, but enormous challenges remain. Such systems need large surfaces at geographical locations with a sufficient difference in height (a few 100m). As discussed in the the introduction, it becomes clear that already now for Germany alone, an expansion of storage systems is needed by a factor of a several hundreds compared to what is available now, thus raising the question what will be needed for a 100% renewable system and how far is this realistic ? Pumped Hydro Storage is the most mature and efficient storage system currently employed on large scale in Europe (EU28 + Norway + Switzerland = EU28+). The estimated power in operation within EU28+ is around 45-48 GW and the energy stored in the range of 600 GWh. It is estimated that the worldwide capacity in operation is nearly 3 times as large and that by 2030, EU28+ could reach a capacity of 75 GW. The storing process simply consists in using the excess electricity produced from various sources, including iRES, to pump water from a lower pool up to a higher located reservoir, such as a dam. Pumped Hydroelectric Storage (PHS) provides more than 98% of all storage capacity for EU28+ and possesses a good efficiency of 70-80%. It is particularly useful for balancing the system as it responds quickly to demand, often faster than most thermal plants. In addition, PHS can begin operation from shutdown without being connected to the network and without requiring network input. Unfortunately, the construction of PHS requires high capital costs because of their large size. One must however be careful when considering only capital cost. Indeed, in addition to a good round-trip efficiency, PHS possesses a lower ratio between capital cost and energy capacity than other electricity storage systems. The real problems with the dams lie in the limited sites available for such constructions throughout Europe. France and Germany are essentially saturated, with Germany planning the construction of a 4 GWh reservoir. In Belgium, the Coo cascade contains an energy supply of 5000 MWh, equivalent to the generation of electricity during 5 hours by a 1000 MW nuclear power plant. There is no other place to build any significant size dam in this country. There is resistance of the population to the presence of a barrage and the environmental impacts caused by the artificial lake. Ecological problems are further exacerbated when the PHS is located near the sea shore and sea water is pumped in the upper reservoir. This technique converts electric energy into compressed air. When releasing the air maintained under pressure and passing it through a turbine, electricity is generated again. There exist only 3 compressed air plants in Europe that are operational on the electricity grids; the first one being the Huntorf plant, built in Germany in 1978 and possessing a capacity of 321 MW for 2 hours! The compressed air is stored in underground caves, a stringent limitation to the use of this technology since only a few suitable sites exist, restraining dramatically the capacity of this method. Moreover, the investment costs are fairly large and the round-trip efficiency is modest, ranging from 40 to 50%. In addition, compressed air storage suffers from relatively slow response time. It only represents 0.65% of the total electric energy stored in EU28+. Flywheels maintain energy in the system in the form of rotational energy (via a spinning wheel) and the amount of energy stored is proportional to the square of the rotational speed and the rotating mass. Typical capacities range from 3 kWh up to 5 MWh (20 MW for 15 minutes). The 12 flywheels employed by electricity users and utilities store about 77 MW of energy. They are classically applied to store excess solar production, to provide momentary frequency regulations to the grid or to smooth sudden changes between supply and demand. One of the largest flywheel installations in the world is in use at the JET (Joint European Torus) fusion device (in Culham, UK) where two flywheels, each weighing 775 tonnes are able to store each 410MW. Flywheels have the advantage of long lifetime and excellent efficiency (90%) with minimal maintenance costs. They can also be cycled numerous times without significant energy losses (>100,000 cycles). Their main disadvantages are their low specific energy (10-11 Wh/kg), high capital cost, limited capacities and especially rapid discharge rates (a few seconds to 15 minutes). At the moment, flywheels store only 0.16% of the electric energy of EU28+. Capacitors consist of 2 electrodes immersed into an electrolyte solution and separated by an ion-permeable membrane, the separator, which enables the passage of positively and negatively charged species, called ions, from one compartment to the other. When a voltage is applied but no current passes between the poles, a charge separation occurs between the ions in solution; the positive species migrate towards the negatively charged electrode (anode) whilst the negative ions move towards the positively charged electrode (cathode). They will then surround the electrodes, generating on each of them what is called a “double layer”. This segregation of charged species results in a difference of potential between the two electrodes and in the storage of electric energy by a combination of electrostatic and electrochemical processes (capacitance and pseudo-capacitance). This is very much akin to what happens in a battery except that, at this stage, no chemical reaction has occurred. In a battery, oxidation-reduction processes take place. The voltage between the two electrodes of a capacitor or a super-capacitor grows linearly with respect to the energy stowed and thus depends directly upon the surface of the electrodes. Hence, materials with large surface area are typically employed. These storage systems have several advantages, such as unlimited charge/discharge cycling (>1.000.000 cycles; since no chemical reactions occur, no decomposition is observed) and rapid response. They can be used to buffer voltage variations in the grid, due to iRES volatility, within milliseconds. Unfortunately, at the present time, their cost is not competitive with other options for medium- or large-scale electricity storage and their energy storage capacity is weak (only about 1/10 that of batteries). Furthermore, as the system discharges, the voltage decreases as well. Research in these domains continues and it is possible that some of them might become competitive with batteries in the next few decades. The excess electricity generated by iRES when the wind blows strongly or the sun is particularly bright combined with a lower demand than production, can be converted into heat instead of being wasted. Unfortunately, the retro-conversion of heat into electricity is not economically viable. Whilst electricity converted into heat can be subsequently employed to warm buildings or generate hot water, the erratic behaviour of iRES is inappropriate for large-scale heat delivery. Who would rely on an unpredictable supply of hot water or on capricious heating during a cold winter? The conversion of electrical energy into chemical energy requires the conversion of a low-energy-content product into a higher-energy-containing entity. This approach involves mostly the conversion of water into hydrogen (H2) and oxygen (O2) or the reduction of carbon dioxide (CO2) into methanol, formate, methane or carbon monoxide (CO). Electrochemical energy storage implies reversible oxidation-reduction reactions with the key-processes taking place in batteries. Storing electricity in the form of chemical energy has been investigated for numerous decades and much work has focused on the electrolytic splitting of water (H2O) into hydrogen (H2) and oxygen (O2). Hydrogen is often considered a “green” fuel by the public since its subsequent reaction with oxygen, in a fuel cell, generates only water and energy. It is therefore a logical step to imagine that the wasted electric energy produced by iRES when consumption is low could be transformed into hydrogen for later reuse when demand is important and iRES are non-productive. Unfortunately, more than two centuries after its discovery, hydrogen generation by water electrolysis is still commercially non-viable, the cost of producing hydrogen by water splitting is far higher than the dehydrogenation of fossil fuels or ethanol (alcohol). A marginal 5% of all hydrogen production originates, as a by-product, from the electrolytic preparation of chlorine and sodium hydroxide. In a simplified picture, a commercial hydrolyser is composed of two electrodes immersed into water and separated from each other by a porous barrier (the separator) which can be a polymeric membrane. Hydrogen gas is produced at the cathode (negatively charged electrode) and oxygen at the anode (positively charged electrode). In theory, the splitting of water into H2 and O2 requires a difference of potential between the two electrodes of 1.23 volts. However, electrolysis of pure water necessitates excess energy since water is a fairly good insulator and it is mandatory to overcome a series of activation barriers. Most electrolyses are thus carried out in corrosive, strongly basic or acidic media. Both of them contain an elevated concentration of ions that transport the charges, decrease the overpotential and enable the use of a lower applied potential. Typically, a difference in potential of 1.5 volts will be employed. The alkaline electrolysers are the cheapest; the acidic ones require a fluorinated polymer containing sulfonic acid functions (such as Nafion-H, a proton exchange membrane) which is quite expensive and fragile (0.1 mm thin, always must be kept humid). The electrodes can be made of platinum or iridium (both are expensive), iron, brass, aluminium, nickel or stainless steel, with nickel and steel being the favoured industrial cathodes. As for the anodes, titanium covered with either titanium oxide, nickel oxide or cobalt oxide is typically employed. Unfortunately, iron is sacrificed during the electrolysis as the anode rusts and the cathode de-rusts. Stainless steel electrodes release toxic materials, brass deposits copper on the cathode and accelerates the rate of rusting and aluminium deteriorates rapidly. Carbon electrodes can also be employed but the pH must be severely controlled to avoid decomposition of the electrode material. Due to a number of competing processes, such as the internal resistance of the cell and the circuit, the retro-reaction in which H2 and O2 combine to give back H2O, and the overpotential (activation energy), there is an unavoidable loss of efficiency of 20% in the form of heat. The production of hydrogen under ideal conditions proceeds with 60% efficiency and needs 4.9 kWh/m3 H2. In other words, 49 kW of energy, passing through the solution for one hour leads to the generation of 11 m3 of hydrogen. Whilst this looks impressive, let’s remember that hydrogen is a particular light gas, with a very low density. In fact, 11m3 of H2 correspond at room temperature and atmospheric pressure to 1 kg of hydrogen. For any practical purposes, hydrogen has to be transported in pipes (under some moderate pressure). The hydrogen produced by the electrolysis of water, using surplus electricity generated by iRES, has to be stored under high pressure (20 MPa, 200 bar) in special cylinders. The safety issue of these highly pressurized cylinders, coupled with the high reactivity and energy content of the hydrogen molecule and its extreme volatility, is definitely a matter of concern, especially in populated areas sited near such a storage facility. Liquefying hydrogen requires cryogenic techniques and temperatures as low as 21 K (-252°C). These are obviously not feasible as electricity storage systems, if only for their costs. Generating electricity back from hydrogen requires the use of a fuel-cell; the efficiency of which averages around 60%. Henceforth, the overall cycle: electrolysis of water to generate hydrogen + regeneration of electricity from hydrogen only proceeds with an overall efficiency of 40%. This means that 60% of the initial electric energy is lost during the transformation of one type of energy into another one and vice-versa. It is therefore unlikely that hydrogen storage will be truly competitive in the foreseeable future. Efficiently and economically transforming CO2 using iRES-generated electricity into useful, high energy compounds such as methanol, methane or carbon monoxide (CO) is often seen as a royal road to a full iRES electrical system.. Such a transformation means that the surplus electricity produced by iRES is not wasted but converted into useful chemicals that can be stored easily and used to compensate energy fluctuations from intermittent sources by regenerating electricity upon demand via their combustion (except for CO which requires an additional, highly energy-consuming step to be converted into hydrocarbons by the Sabatier reaction). Despite these exciting prospects, no commercial applications have yet become available. The main reasons are the numerous products obtained during the electrolysis of CO2, the cost associated with their separation, the poor efficiency of the electrolytic process and, in many cases, catalyst degradation. Battery technology is currently a favorite method for future storage of the electricity generated by intermittent renewable systems. Though battery storage represents only a modest 0.47% of all the electric energy stored in EU28+, massive investments are being made in Europe and worldwide for the mass production of batteries – especially lithium-ion batteries – at an affordable price of 120-150€ per kWh, nearly half of the current cost. However, high prices are only but one problem of energy storage using batteries. A classic battery is composed of two electrodes, a cathode (positively charged) and an anode (negatively charged), an electrolyte (typically a solution containing a specific salt and a separator, which can be a porous material or a membrane. The whole assemblage is sealed in a protective metallic casing. When an electric current is passed between the two electrodes, an oxidation-reduction process takes place. During the discharge of the battery, the opposite chemical reaction occurs, generating an electric current. The main advantage of batteries is their fast response (usually in the order of milliseconds) which makes them attractive for voltage and frequency control when rapid action is required. Their main disadvantages are their relatively high prices, moderate energy densities, important weight and limited cycling lifetime. Lead-acid batteries: These are the oldest rechargeable battery systems used today, principally in the automobile sector. In the fully charged state, the negative electrode is composed of lead and the positive one of lead oxide; the electrolyte is concentrated sulfuric acid. Overcharging leads to water electrolysis and formation of hydrogen and oxygen. Small vents are thus present on the battery to enable release of these gases. When discharge takes place, the lead anode reacts with the sulfuric acid generating lead sulfate and water. At the same time, the lead oxide cathode is also converted into lead sulfate and water. Because sulfuric acid is consumed in this process, at the end of the discharge, the electrolyte contains a dilute sulfuric acid solution in water. Charging the battery results in the opposite reactions taking place. Lead-acid batteries have a typical specific energy of 33-42 Wh/kg and a specific power density of 180 W/kg. Their charge-discharge efficiency is variable and ranges from 50 to 95% depending upon usage. Whilst classic lead-acid batteries (delivering 2.1 volts) are able to supply high surge current, they do not like deep discharge and are easily damaged under these conditions. Deep-discharge lead-acid batteries have been prepared using tubular shape cathodes. These batteries are employed in a large number of applications, ranging from electric bicycles and motorbikes to energy storage systems for backup supplies. Their cost is fairly low and recycling of lead-acid batteries is one of the most successful recycling programs worldwide. Despite all these advantages, using lead-acid batteries – or any battery for that matter - to store excess electricity produced by iRES is still far from being an achievable goal in the foreseeable future because of the enormous volumes and amount of weight involved. Nickel-cadmium (Ni-Cd), Nickel-metal hydride (Ni-M-H) and Nickel-zinc (Ni-Zn) batteries: these batteries have been used in a number of applications such as portable electronic devices, toys and electric vehicles, to cite only but a few. They are now slowly losing ground because of the toxicity of some of the metals employed and the high cost of nickel. The Ni-Cd system provides a rather constant voltage of 1.2 volt during discharge almost towards the end of the discharge. It possesses a specific energy density of 40-60 Wh/kg and a specific power density of 150 W/kg thus being competitive with lead-acid batteries for uninterruptible power supplies. Ni-Cd batteries are more expensive than lead-acid and specific regulation has been imposed on them due to the high toxicity of cadmium. Nevertheless, they sustain a greater number of charge/discharge cycles (up to 2,000 cycles), are more difficult to damage than other batteries and tolerate deep discharge (Ni-Cd batteries are typically stored fully discharged). This electricity storage system suffers, however, from a “memory effect”. In short, after several charge/partial discharge cycles, the battery “remembers” the point where the discharge took place and will behave as if it is completely empty, even though some energy is still contained within the system. Nickel-metal-hydrides (Ni-M-H) batteries are less costly and toxic than Ni-Cd, possess higher energy density and suffer much less from the memory effect. They are composed of nickel and a combination of other metals such as rare-earth elements (lanthanum, cerium, neodymium, praseodymium) and/or titanium, zirconium, cobalt, manganese, chromium, iron and aluminium. The role of these metals is to form reversibly a metal-hydride species M-H. The electrolyte is typically potassium hydroxide (KOH), the cathode is nickel hydroxide and the anode the derived metal hydride. Their specific energy is in the range of 60-120 Wh/kg and their specific power averages between 250-1,000 W/kg for a nominal cell voltage of 1.2 volt. Unfortunately, they display a high self-discharge rate of 5-20% on the first day, at room temperature, then of 0.5-4% per day afterward. This can result in an overall 30% loss per month and the self-discharge rate is enhanced with increasing temperatures. Lithium-ion (Li-ion) batteries: For a number of reasons, Li-ion batteries are being pursued as THE future of electric energy storage. Whilst they possess several advantages, such as good efficiency, reasonable life cycle, low maintenance and self-discharge, and little to no memory effect, they are fairly expensive and need a smart battery charger to avoid damage to the cell which can, in the worst case, catch fire. There exist several types of lithium-ion batteries, with the most efficient and safer ones being the lithium-polymer systems. The Li-ion battery is made of a carbon anode (negative electrode) and a positive electrode (cathode) composed of Lithium-cobalt oxide, lithium-manganese oxide, lithium-titanate or lithium-iron phosphate. The electrolyte is usually an organic solvent, such as ethylene carbonate, containing various soluble lithium salts (lithium perchlorate, lithium tetrafluoroborate or lithium triflate). The lithium-ion-polymer system contains, instead of the liquid solvent, either a gel or a polymeric electrolyte such as poly-ethylene oxide, poly-acrylonitrile or polymethyl-methacrylate. These will enable the passage of lithium ions from one electrode to the other. A separator, which can also be a polymer, is employed to separate the two poles and avoid short-circuits. The main advantage of lithium-ion polymer technology is that it combines high energy density (up to 260 Wh/kg) with a varied choice of shapes and sizes. Lithium-ion batteries contain a large number (18,650) of individual cells connected to each other that need to be balanced in order to avoid differential charging or overcharging of the individual components. When charging a lithium-ion battery, the lithium ions migrate from the carbon electrode to the cathode, forming an intercalation complex, i.e. the lithium ions insert between the layers of the positive electrode whilst the metal (cobalt, manganese, iron or titanium) is reduced. When the cell produces electricity, the reverse phenomenon occurs. Lithium-ion batteries don’t suffer from memory effect, can be charged readily (2-3 h), have a response rate in the order of milliseconds to seconds, can be cycled 10,000 to 100,000 times and have an efficiency around 85-90%. They last about 5-7 years. One of the main problems being faced by the lithium-ion battery manufacturing is the cost of and access to lithium itself. Indeed, as lithium batteries are produced on an ever-increasing scale, the amount of lithium (and of cobalt when employed in the same cell) required to satisfy the demand is escalating. Already, more than 25% of the lithium produced worldwide is used for small batteries employed in electronic devices such as laptops and portable phones. The requirement for electric cars is even higher and, if lithium-ion batteries are to be used on large scale for domestic energy storage (in addition to photovoltaic cells) and for stowing excess electric energy produced by windmills or concentrated solar farms, the production of this metal in sufficient quantity may become a problem of significant importance. Lithium is present in small amount in the oceans (0.1 – 0.2 mg/liter), in several minerals (pegmatites, spodumene and petalite, 0.5-2% Li) and in brines (salt lakes, salars, geothermal brines, sea-water deposits, 0.04 – 0.16% Li). Most of the production of Li, in the form of lithium carbonate (Li2CO3) comes from brines (30-50% cheaper and less polluting than from the rocks; obtaining it from sea-water is far too expensive to be commercially viable) and 70% of the world deposits are in South America. Chile (7.5 Mt, 1500-2700 mg/liter), Bolivia (9 Mt, 530 mg/liter) and Argentina (2.6 Mt, 400-700 mg/liter) are the main producers of Li2CO3 whilst China is the major manufacturer of Li-ion batteries (55% world supply predicted to rise to 65% in a year or two). There is also ongoing research in extracting Li from seawater. The idea of storing the excess electric energy produced by the iRES using lithium-ion batteries is only really viable on a small scale. Let’s consider an average annual Belgian household load of 3500 kWh. Solar power can generate a maximum of 40% of the electricity needs. Going beyond this value will require energy storage using batteries. An installation able to cover 70% of the electricity needs would cost well over 15000€. Even a reduction in the cost of the batteries will not solve this problem since batteries are only a fraction of the total installation amount. Reaching total energy independence will require a massive photovoltaic and battery capacity, leading to oversized installations at an exorbitant price. The weekly electric energy consumption of France is in the order of 1 TWh, i.e. 1 billion kWh. To store only two days of this amount of energy would require, using the most performing current lithium-ion technology, 12 million tons of batteries, which implies 360,000 tons of lithium. The annual worldwide production of lithium ranges around 40,000 tons! In the EU28+, storage by lithium batteries represent only 0.47% of all the electricity gathered by the various technologies described above (see also above). ents only 15 seconds of the world electricity demand! Adding hydro (500 GWh) will enable us to provide electricity for 10 minutes. After that, the world will become dark. In 2015, the biggest energy storage projects built around the World amount to a minuscule 176 MW. The total world storage capacity nowadays, including batteries, flywheels, compressed air systems and thermal units, averages to 12 GWh. This represents only 15 seconds of the world electricity demand! Adding hydro (500 GWh) will enable us to provide electricity for 10 minutes. After that, the world will become dark. No system producing large amounts of electricity is free from downsides. While negative aspects of fossil fuel and nuclear are largely advertised and commented in the public, wind and solar are often presented as clean problem-free energy sources. This is not realistic, and below we present a brief review of direct adverse effects associated with intermittent Renewable Energy Sources (iRES), aside from those associated with intermittency and cost discussed above. Many wind turbines use rare earth elements in their magnets. These materials are obtained from mining and recycling and involve chemical refinement processes neither of them being particularly ecologically clean nor friendly to the surrounding populations if not safely managed. This market is dominated by China that threatened, at the beginning of this decade, to reduce export quotas. Rare-earth free turbines are now being developed but, obviously, turbines are not the only technology using rare earth materials and this potential problem has to be factored in an evaluation of a wind-dominated energy system. The construction of wind turbines produces heavy metal air pollution. Solar photovoltaics involve the toxic heavy metals cadmium and lead and their dissemination in the environment has to be severely controlled in the production and decommissioning phase, or even in case of fires in buildings containing such installations. Because of their relatively short life cycle and their low energy density iRES-dominated energy systems will require recycling or disposing of an important volume of materials. Obviously, adequate regulations will have to be put in place to ensure that this is appropriately done to avoid abandoned obsolete equipment being left rusting in place, like is the case for a number of abandoned windfarms (e.g. the Mojave Desert ones). The impact of the large areas required by iRES systems also matters as people are often reluctant to the installation of new systems for aesthetic, comfort of life or economic (loss of property value) reasons. If their use still grows, more and more people will be affected. A growing number of reports from medical doctors, associations and acousticians reveal a negative health impact on human beings living nearby wind turbines. The wind industry tends to discard such trouble reporting on the ground that “what you can’t hear cannot harm you”. The physical effects of wind turbines have been studied in detail and are now rather well understood. The rotating blades generate two kinds of sounds: the first one, audible by the human ear (Low Frequency Noise), is a mix of grinding, creaking and banging, often in a repetitive mode. The second one, inaudible by the human ear, consists of Infrasound. They are collectively known as Infrasound and Low Frequency Noise (ILFN). The Low Frequency Noise is reported to deplete people from a restoring sleep, which is known to cause symptoms such as hallucinations, disorientation, memory loss, dizziness and change in behaviour. The negative action of Infrasound is more insidious since one cannot hear it. These sounds reach little specialized cells in the cochlea called Inner Ear Outer Hair Cells, disturbing the balance mechanism of the inner ear, and leading to symptoms called Disabling Vestibular Dysfunction Symptoms. The effects of ILFN have been known for decades, Infrasounds having been used at places as a method for crowd control. The rotating blades of wind turbines are also known to generate stroboscopic effects by blocking the sunlight on a more or less repetitive manner, even long after sunset. People have reported suffering from a number of syndromes, which they attribute to the stroboscopic effect. Although one can question the causal relation between the actual ILFN levels and amounts of light modulation produced by wind turbines and the unease or disease of people living nearby, the suffering of the latter cannot be denied. These effects should therefore be seriously considered, advertised and investigated scientifically. Wind turbines are known to kill a significant amount of birds (blade tips can reach a speed around 300 km/h leaving little chance to a bird that is in the way). Among the victims, one can find, aside a variety of common birds, the US Golden Eagle (for which exceptions have been made for wind energy in the draconian US protection legislation), the German White tailed Eagle, the Australian Tasmanian Eagle and a large number of protected raptors. The Spanish Ornithology Society published, after an extensive survey of a large number of wind farms, a detailed report showing that the casualties in Spain alone average between 6 – 18 million birds and bats killed per annum. They also revised the number given by the US administration, giving a rough estimate between 10 - 14 million birds and bats killed in the US by wind turbines. Similar numbers are obtained for Germany and Sweden. Note that this is orders of magnitude greater than the catastrophic BP oil spill that occurred in the Gulf of Mexico and was responsible for the disappearance of 800.000 birds, for which BP was blamed and had to pay. Less known than the case for birds and underestimated in the past, bats are also harmed and killed by wind turbines. Whereas birds are hit by the blades, bats are destroyed by a very different mechanism called barotrauma. As the blades spin, they create a change in air pressure, which drops significantly (up to 5 – 10 kPa) at the blade tip vortex. Such a decrease in pressure causes fatal damages to the lungs of bats by rapid expansion of air in their lungs. Bats having large lungs and hearts and possessing blood-gas barriers that are thinner than those of terrestrial mammals making them very exposed to barotrauma. Solar installations also take their toll on birds. The Ivanpah station in California uses thousands of mirrors to focus sunlight and heat up a reservoir that generates steam and, hence, electricity. Over the first year of service, it destroyed over 3.500 birds. Attracted by the blinking mirrors, the birds cross the highly energetic and focused sunrays and literally catch fire. “The energy return on (energy) investment (EROI) is a measure of the useful energy produced by a particular power plant divided by the energy needed to build, operate, maintain, and decommission the plant”. This is an essential concept in any discussion on energy because it answers the question “How much useful energy do we obtain for a certain effort to make this energy available” independently of economic and financial questions, themselves dependent on time, politics, social organization, etc. If the EROI is equal to one, this means you are producing energy only to produce energy without any other benefit, i.e. this is a useless activity. If your energy producing systems have a large EROI, they provide you margins for cultural, scientific, industrial and any other development. In order to feed the population, sustain an efficient educational system, allow travel and cultural expansion, Kelly et al. (op. cit.) estimates that an EROI of 10 is required. If your energy systems have a large EROI, your industry will easily be competitive; if not, it will struggle for survival on the economic market. EROI’s have been calculated for different systems as shown below. Fig. 9. EROI’s of different energy systems. Unbuffered systems (blue) have no associated storage. Buffered systems (yellow) have the storage required to cope with their intermittency. Technologies that lie below the economical threshold are contained in the gray area at the bottom of graph. 8. Analysis : Is 100% renewable electricity a realistic option ? Based on the example of Germany, the analysis in this paper has shown that, due to the physical, technological and economic limitations, an IRES electricity production system on a large scale, close to 100%, is not a realistic option. Not many countries are able to pay for such a costly and inefficient system, demonstrated by the German renewable energy experiment. There is an urgent need to consider all possible energy options in the future, like new generations nuclear fission reactors, fusion, geothermal energy sources etc. 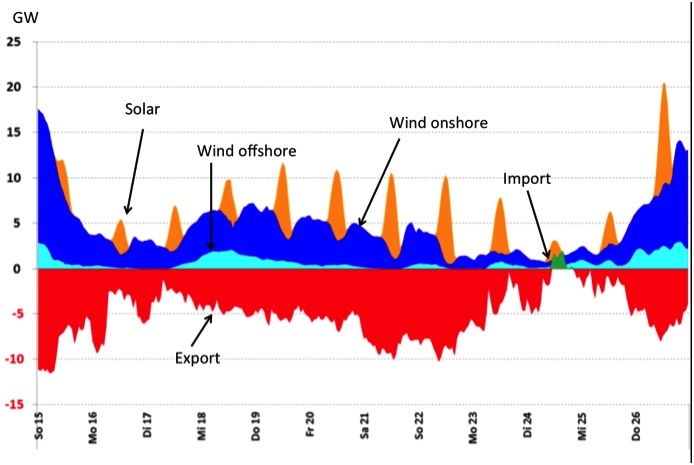 The high intermittency of solar PV and wind power has substantial consequences, and the preceding paragraphs should give an insight into the complexity of an electricity system with a large fraction of iRES. One could conclude that further increasing the installed iRES capacity is a possible solution as it would increase the amount of electricity produced. However, this would be highly uneconomical. Massive amounts of electrical storage would be needed, being able to process hundreds of GW and thus also store several hundreds of GWh in a few hours, i.e. at a scale far beyond what is possible today. The needed technology is not available and will require years of basic research in case of chemical storage (if successful) and/or an enormous amount of hydro power based systems. Moreover, all these storage systems face efficiency problems as they are used for small fraction of the time, making full-scale use of them very questionable. Further, if one keeps the current Alternative Current grid technology, a certain minimum amount (~ 20-25%) of “rotating mass” has to be present to guarantee stability. If this cannot be sufficiently provided using biomass, and if fossil and nuclear based power stations are not allowed, problems will arise. Instabilities caused by large contributions of intermittent power e.g. from wind or solar PV pose a major threat to the stability of the electrical network of a country and to the safe operation of conventional generator systems, as exemplified in Ireland. If no economical solution can be found for such difficulties, conventional backup power based on fossil fuels or nuclear power will necessarily have to remain part of the electricity system. A last point is the economic feasibility of such a system. Germany, with currently an installed capacity of about 90GW in solar PV and wind, has one of the largest renewable systems installed in the world. The cost (including feed-in tariffs, subsidies, extra costs because of court cases due to unfulfilled promises etc…) is estimated between 250 and 300 billion Euros, integrated over the last 10 years. The CO2 reduction on world scale realized by this system is less than 1‰. As discussed above, a 100% iRES without backup or storage systems makes not much economical sense and will lead to a doubling or tripling of the total costs, compared to the conventional system in use now. It is to be expected that not many countries are able to pay for such a costly and inefficient system. The question can thus be raised if the current EU plans for the electricity sector are bound to fail? Finally, the electricity sector is only a minor part of the problem. If one wants to completely decarbonise our economy then one should also include other private and economic sectors. Given already the challenge of a 100% renewable electricity system and the complexity of replacing the present primary energy supply based mainly on chemical energy by renewables, this total decarbonisation looks to be wishful thinking, at least at the present stage of technology. Would it not be more useful to invest in research and development of conventional and new energy systems rather than blindly investing in an existing “green” technology which seems bound to miss its goal? The other question is whether decarbonisation should be our primary concern. Is this really the best investment for a better future for mankind, as discussed in B.Lomborg, “Cool It”? A critical assessment of the EU plans is also voiced in countries outside the EU, in particular the United States under the presidency of Obama. Does transforming the present primary electricity supply (based presently mainly on fossil and nuclear sources) into a 100 % intermittent Renewable Energy System, as imposed by the EU, need to be the challenge and moral quest of the 21st century? This will for sure affect our society and standard of living if current EU plans are not corrected for the problems that are emerging from the grand renewable experiment in Germany of the recent years. H. Jacobi and R. Schuster are gratefully acknowledged for stimulating discussions and precious help in preparing Figs. 1, 2, 4a, 4b and 5. ^ Federal Ministry for Economic Affairs and Energy, Working Group on Renewable Energy Statistics (2017). ^ Data from ENTSOE-e and the European Energy Exchange AG, Leipzig, Germany. Graphical display by R. Schuster. Geothermal: 0.039 GW, 0.2 TWh. ^ Data from ENTSOE-e and the European Energy Exchange AG, Leipzig, Germany. Graphical display by R.Schuster, op. cit. ^ Capacity factor is defined here as the averaged unrestricted output divided by the installed capacity. E.g. in Germany out of the installed 40 GW onshore wind power, only 8 GW was produced on average over the year, i.e. the capacity factor is 20%. For solar PV panels in Germany, the capacity factor is around 10%. This is different from the utilisation factor of a generator, being the actual averaged output divided by the installed capacity. Thus, if the output of wind turbines were to be noticeably curtailed, then the so-called utilisation factor would be lower than the capacity factor. ^ M. Zarifakis et al., “Models for the transient stability of conventional power generations stations connected to low inertia systems”, Eur. Phys. J. Plus 132, No.6, 289 (2017). ^ Federal Ministry for Economic Affairs and Energy, “Fakten und Argumente. Redispatch in Deutschland: Auswertung der Transparenzdaten, April 2013 bis einschließlich Mai 2017, Berlin, 08. Juni 2017”, op. cit. ^ D. Ahlborn, H. Jacobi, World of Mining, Surface and Underground 68, 2-6 (2016). ^ Federal Ministry for Economic Affairs and Energy, “Eckpunkte fuer die Reform des EEG” (2014). ^ D. Ahlborn, H. Jacobi, World of Mining, Surface and Underground 68, 2-6 (2016), op. cit. ^ Z. Boldiš, Europhysics News, 44, no.4, 16-18 (2013). ^ German Federal Ministry for the Environment (Umweltbundesamt) “Entwicklung der Treibgasemissionen in Deutschland” (2016). ^ German Federal Ministry for the Environment (Umweltbundesamt) “Entwicklung der Treibgasemissionen in Deutschland” (2016), op. cit. ^ DICE-Konsult, Duesseldorf, “Kosten der Energiewende” (2016) and Peter Altmeier in February 2013 then German Federal Minister for the Environment, Nature Conservation and Nuclear Safety. ^ P. Zweifel, A. Praktiknjo, G.Erdmann et al. “Energy economics”, 1st Edition, Springer Texts in Business and Economics, ISBN 978-3-662-53020-7, (2017). ^ S. Furfari, “The changing world of energy and the geopolitical changes, 1. Understanding energy developments”, www.amazon.com, ISBN-10: 1-5354432039 (2017), op. cit. ^ Primary energy consumption gives a measure of the total energy demand of a country. It covers consumption of the energy sector itself, losses during transformation (for example, from oil or gas into electricity) and distribution of energy, and the final consumption by end users. It excludes energy carriers used for non-energy purposes (such as petroleum not used not for combustion but for producing plastics). ^ Federal Ministry for Economic Affairs and Energy, “Energiedaten, Gesamtausgabe” (February 2017). ^ One starts to wonder what the total cost will be to decarbonize the electricity production including all European countries, and in a second step what the cost will be to fully ‘decarbonize’ Europe, including transport and heating? ^ F. Vahrenholt, “Germany’s Energiewende: a disaster in the making“, presented at the UK House of Commons on 17 January 2017. ^ ”Frühestens 2025”, Energiespektrum No 2, 50-54 (2017). ^ Federal Ministry for Economic Affairs and Energy, ”Erneuerbare Energien in Zahlen: Nationale und internationale Entwicklung im Jahr 2015”, Berlin, September 2016. ^ F. Wagner, "Surplus from and storage of electricity generated by intermittent sources", Eur. Phys. J. Plus 131: 445 (2016), op. cit. ^ Federal Ministry for Economic Affairs and Energy, ”Erneuerbare Energien in Zahlen: Nationale und internationale Entwicklung im Jahr 2015”, Berlin, September 2016, op. cit. ^ J. Etherington, “The Wind Farm Scam”, Independent Minds, 2010; ; Forschungsgemeinschaft für Elektrische Anlagen und Stromwirtschaft(FGH) e.V., Mannheim; CONSENTEC Consulting für Energiewirtschaft und –technik GmbH, Aachen; Institut für Elektrische Anlagen und Stromwirtschaft (IAEW) der RWTH Aachen, "Studie zur Ermittlung der technischen Mindesterzeugung des konventionellen Kraftwerksparks zur Gewährleistung der Systemstabilität in den deutschen Übertragungsnetzen bei hoher Einspeisung aus erneuerbaren Energien, Abschlussbericht 20”, Aachen, January 2012. ^ R. Partanen & J.M. Korhonen, “Climate Gamble” ISBN 978-952-7139-05-9 (2017). ^ M. Huart and L. Sonnerup, “JET Flywheel Generators”, Proc.Instn.Mech.Engrs, 200, A2, 95 (1986). ^ A.I. Yuvaraj, D. Santhanaraj, Materials Research 17, 83-87 (2014). See also: http://www1.lsbu.ac.uk/water/electrolysis.html and also: Papagiannakis, I, “Studying and improving the efficiency of water electrolysis using a proton exchange membrane electrolyser” 2005. For a review on hydrogen generation: J.R. Rostrup-Nielsen, T. Rostrup-Nielsen, “Large-scale hydrogen production” Topsøe Technologies. ^ For an excellent review, see: M. Ragheb, “Energy hydrogenation and decarbonization” http://mragheb.com/NPRE%20402%20ME%20405%20Nuclear%20Power%20Engineering/Energy%20hydrogenation%20and%20decarbonization.pdfSee also: A.S. Agarwal, Y. Zhai, D. Hill, N. Sridhar, ChemSusChem, 4, 1301-1310 (2011). See also: M.T.H. Le, “Electrochemical Reduction of CO2 to Methanol”, Louisiana State University, 2011. ^ See: “Batteries are hitting physical limits” http://www.dw.com/en/batteries-are-hitting-physical-limits/a-19449790See also: Bulletin of the Atomic Scientists: http://thebulletin.org/limits-energy-storage-technology and R. Andrews “The Holy Grail of Battery Storage” (2016) http://euanmearns.com/the-holy-grail-of-battery-storage/For general reviews, see: http://en.Wikipedia.org/wiki/Lead-acid-battery and https://en.wikipedia.org/wiki/lithium-ion-battery. For a review on the extraction of lithium from various sources, see: P. Meshram, B.D. Pandey, T.R.Mankland, Hydrometallurgy, 150, 192-208 (2014).For calculations of the cost of installing batteries, see: G. de Oliveira e Silva, P. Hendrick, Applied Energy, 195, 786-799 (2017). ^ T. Hoshino, “Innovative lithium recovery technique from seawater by using world-first dialysis with a lithium ionic superconductor”, Desalination 359 59–63 (2015). ^ J. Rydell, R. Ottval, S. Pettersson, M. Green, “Vindkraftens påverkan på fåglar och fladdermöss” Uppdaterad syntesrapport 2017, NATURVÅRDSVERKET (see p. 12 for the English summary). ^ M. Kelly, “Lessons from technology development for energy and sustainability “, MRS Energy & Sustainability 3/e3(2016) ; J.Rydell, R.Ottval, S.Pettersson, M.Green, “Vindkraftens påverkan på fåglar och fladdermöss” Uppdaterad syntesrapport 2017, NATURVÅRDSVERKET (see p. 12 for the English smmary). ^ D. Weissbach et al., “Energy intensities, EROIs (energy returned on invested), and energy payback times of electricity generating power plants “, Energy 52(2013)210. ^ M. Kelly, “Lessons from technology development for energy and sustainability “, MRS Energy & Sustainability 3/e3 (2016), op. cit. ^ Forschungsgemeinschaft für Elektrische Anlagen und Stromwirtschaft(FGH) e.V., Mannheim; CONSENTEC Consulting für Energiewirtschaft und –technik GmbH, Aachen; Institut für Elektrische Anlagen und Stromwirtschaft (IAEW) der RWTH Aachen, "Studie zur Ermittlung der technischen Mindesterzeugung des konventionellen Kraftwerksparks zur Gewährleistung der Systemstabilität in den deutschen Übertragungsnetzen bei hoher Einspeisung aus erneuerbaren Energien, Abschlussbericht 20”, Aachen, January 2012, op. cit. ^ B. Lomborg, “Cool It”, Knopf Publishing Group (2007-09-04), ISBN 978-0-307-26692-7; also Vintage Books (2010). ^ R. Bryce, “Maintaining the advantage: Why the U.S. Should Not Follow the EU’s Energy Policies”, The Manhattan Institute (2014). A propos de l’auteur Jozef Ongena, István Markó, Raymond Koch, Anne Debeil Pr. Jozef Ongena (European Physical Society), Pr. István Markó (Université catholique de Louvain) †, Raymond Koch (Plasma Physics Laboratory, Royal Military Academy, Brussels, Ir), Anne Debeil. Citer comme Jozef Ongena, István Markó, Raymond Koch, Anne Debeil, "Hidden consequences of intermittent electricity production", Arguments — Revue européenne de science, vol. 2, n°2, été 2017, http://revue-arguments.com/articles/index.php?id=76.